Artists constantly tell us that they need guidance for rendering skin tones in their portraiture.This back helps them overcome this elusive challenge by providing a clear set of easy-to-forlow principles for painting a variety of skin tones in three major mediums—oil, pastel and watercolor. The first chapter is rooted in the basics, showing artists how to recognize and use the five major elements of painting: drawing, value color composition and edges. 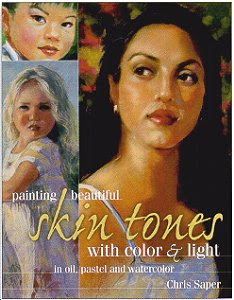 From there, artists learn how to work with light, shadow and color to effectively capture the beautiful skin tones of various ethnic groups, including Caucasian, Asian, African-American and Hispanic. Next, artists discover how to execute the principles learned, using detailed instruction for color selection, mixing and application. Four mini-demons, three long demos and many examples illustrate the lessons. Artists will benefit from advice on shooting and choosing photographs to paint, how to edit their compositions and work past their imitations. Chris Soper’s portraits are currently held in private and corporate collections throughout the US and Canada. Her award-winning work has been featured in several books, including "The Best of Portrait Painting". She lives in Phoenix, Arizona.